Particles are a necessary evil when you start learning Japanese. They can be tricky but once you understand them Japanese (and especially grammar) becomes so much easier! For complete beginners, particles are markers in the sentence connecting words together. Similar to “a” “to” “and” “or” ect. For example, in a simple sentence “I am Niffer” you would say “watashi wa Niffer” ‘wa’ being the particle in this sentence. You can see a list of all these particles at Nihongo Ichiban which might seem like a lot but they are fairly easy. You could try and cram particles but it is a lot easier to learn them in context by using other resources. All About Particles – I looooove this book. It is small and short and is great for all levels of Japanese (even if you don’t know hiragana/katakana). It goes through each particle with an easy description of what they do along with example sentences so you can see them in action. £9.77 and worth it. 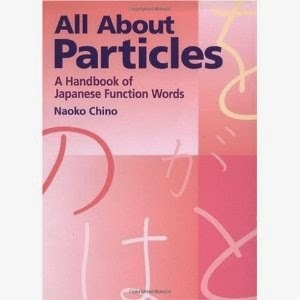 I have not used any other books for learning particles but there’s a huge list of them on Amazon which you can look through to find one that suits you (if you’d prefer). Tae Kim’s Guide to Grammar – This is a great guide to grammar for beginners. He has step by step guides for all the grammar including particles, which the lessons for are broken up between other grammar lessons so you don’t overload your brain. JLPT Bootcamp – Has a collection of videos teaching you about particles (great if you’re an audio/visual learner). I have now created two courses on Memrise which help you learn Japanese. Memrise is a flashcard program where you can tap or type the answers. It can be used on computer, Android or iOS. Personally I prefer All About Particles. It makes sense, is easy to read, you can read it over and over and can help put particles into context a lot better than other methods. But it does help to practice using particles which, unfortunately, it doesn’t do. Then once you’ve learnt the particles but find you’re still getting stuck, you can use this cheat sheet from Tofugu! But it is best to try and recall from memory to get your brain trained so try not to use it too much. The best way to keep those pesky particles in your head is to keep using them. Read basic Japanese sentences, write basic sentences on sites like Lang8 and get native speakers to correct your mistakes (even if it’s a list of what you did today like “I ate breakfast. I went to the park” etc). I find people learn faster from making mistakes than getting it right first time. And if you get used to making mistakes now you’ll be less afraid to make them, and less likely to make them in the future!